We in America are all products of a mobile society. We move. We need to get from here to there and we like to do it quickly. We multitask because there is so much to do and so little time to do it. Once in the car, driving down the road at speed, it is annoying to have to stop. Red lights are the bane of our existence. 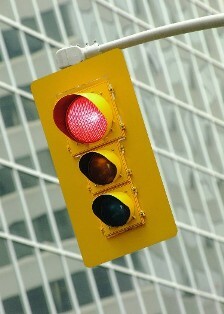 However, not wanting to get killed at each intersection, we mostly follow the law and stop at lights, mildly fuming. Unless we are already running late and then we are fuming at a higher degree. Waiting at lights in South Carolina is a tedious prospect. They are timed to allow lots of cars to pass on the green which is great if you have the green. But that means they are long red lights. So as you wait at a red light, the minutes can tick past on the clock and you sit and fume. Then someone right there over on the right finally gets done pumping gas and pulls up to the curb, hoping to join the flow of traffic. You have already been sitting in the not-flowing-traffic for a while, trying to remain patient while the light stays red. You begin counting cars. You seem to be about the eleventh in line, but the light usually leaves fourteen or fifteen through. You should be safe and make the next green light. Things aren’t so bad. The light finally, or rather FINALLY changes to green and traffic begins to flow. This is where the annoying as hell do-gooder comes in. This kind soul doesn’t go. He or she waves to the person in the gas station, the person who just moments before pulled up there, to come on. They can enter the now flowing traffic. Well, flowing in front of the do-gooder anyway. The gas station patron is usually rather slow on the uptake of the gesture of kindness and takes a bit to get going. The now fully gassed up car pulls into the line of traffic and makes it through the light as it turns yellow with the do-gooder scooting through in the nick of time. The do-gooder is feeling all sanctimonious and happy to have brought some joy into the world. I usually wish them a bit of intense misery and I’m guessing all of the six or seven cars that didn’t make it through the light and now have to wait again for another long and painful red “time out” to pass are also less than pleased. The overall improvement in the world is actually a negative. You helped one person and irritated the rest of us. Let people out during the red lights when we are all stopped anyway. I was waiting in line for the green far longer than the guy in the gas station (there is an implied “you moron” or possibly “you dolt” in there). All of us who missed the green light because YOU chose to be “generous” don’t feel like you were generous at all. We were all paying for your “generosity.” If you wanted to be one with the crowd, you wouldn’t have barely scooted through the yellow light. It isn’t only at lights. I was at the outlet mall looking for a particular item. I found what I thought I was looking for early in my search, but it was a bit more expensive than I was counting on, so I continued to look. I shopped through the entire mall and found nothing better so I went back to the first store. There had been only one clerk the first time I was there and that hadn’t changed. But now there were several people in the store and a long line at the cash register. The woman at the head of the line completed her transaction and then said to the clerk, “I cut my finger at breakfast this morning and carrying all these bags is starting to hurt. Do you have a Band-Aid?” The clerk did, but it was in the back. So off she went to get it in order to help the customer, leaving the other five of us waiting in line. I had a Band-Aid in my purse and offered it to the (I could describe the woman but it would be said I was treating her stereotypically) customer in “need” with the horrible boo-boo she had since early that morning. I said I would give it to her to keep the clerk at the register, but the “kind” saleswoman had already left on her errand. I’m willing to bet the injured woman would have looked at the line of waiting people and said something like, “It’s okay, I can get one elsewhere.” She wouldn’t have wanted to wait for all of us for a silly Band-Aid, but it was perfectly okay in her mind to think we should all wait for her. I’m also betting the saleswoman thought she was doing a good deed for the customer who was unable to handle knives or plan ahead enough to bandage her own hand before going out into the world. Nothing really bad happens in these situations. They aren’t the end of the world. I would just like to point out to those who think they are spreading joy and making the world a better place for all, to think about their actions. If you are “punishing” or delaying several people in you quest to help one person avoid the same wait, you haven’t gained. You have lost ground. I always let people out of gas stations on red lights. I believe I am a courteous driver and a kind soul. I was willing to supply the bandage myself. I just wish people would look at what their choices are doing to the rest of us in the same line.